JetSpot Launches "Speed On Demand" Service! JetSpot Launches “Speed On Demand” Service! HomeJetSpot AnnouncementsJetSpot Launches “Speed On Demand” Service! JetSpot Networks has announced the launch of its innovative ‘Speed-on-Demand’ service for its broadband customers for speeds upto 20Mbps. 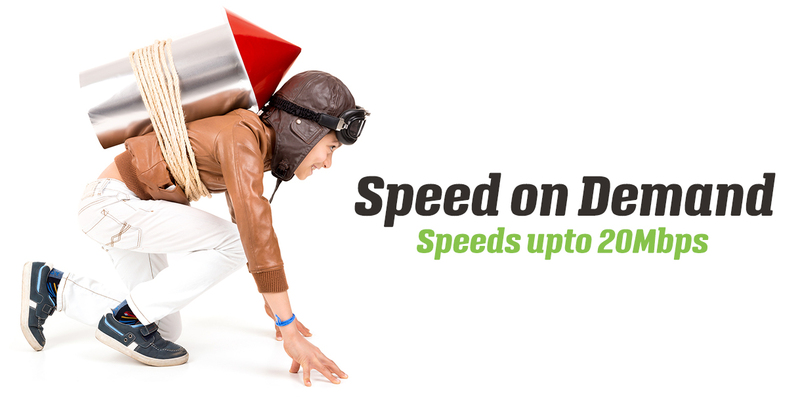 ‘Speed on Demand’ offers JetSpot broadband customers to upgrade their broadband speed for a select duration and pay for only that usage. This ‘Pay as You Use’ model allows customers the flexibility of enjoying high speed broadband to access applications such as downloading some urgent files, upgrading apps or OS, or video conferencing, gaming, without changing their current plan. You want to skype with you beloved who stays like miles away and your current plan is 2Mbps, which buffers or lags while doing skype video calls, this is the service for you! You need an urgent video to get downloaded because you are with your friends for the night stay, this is the service for you! You need a urgent update or upgrade to download quickly, this is the service for you! You want to finish your work quickly and go out, this is the service for you! Who can use for this service ? Only JetSpot existing customers would be able to use this service provided they have a valid JetSpot Plan active on their account. Inactive accounts cannot use this service. Goto our “Speed on Demand” Plans page. Select your package and click on BUY NOW. Once purchased, fill this form below and our team will activate it for you and send you a username and password to login and use. If you haven't yet purchased, please book the package first.